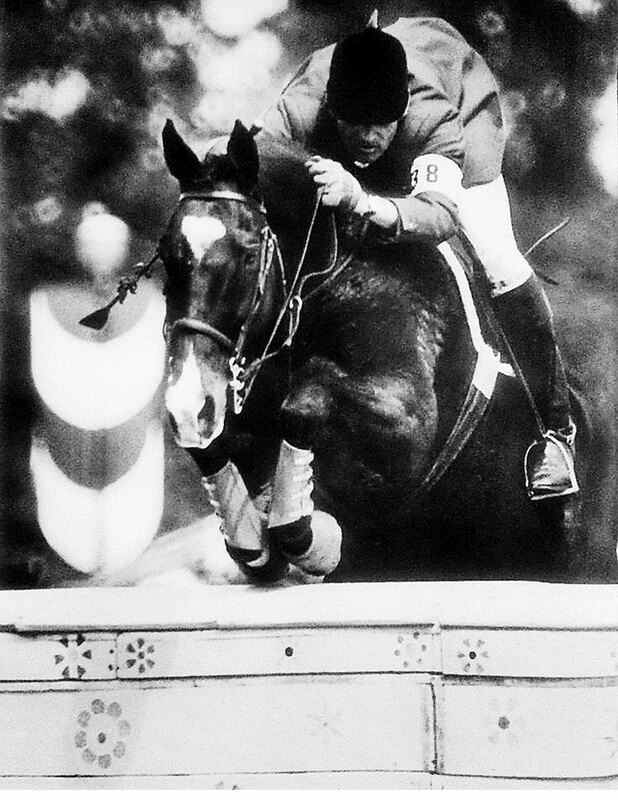 Snowbound with Bill Steinkraus in the Individual competition of the 1972 Olympics in Munich, which was Snowbound’s last competition. 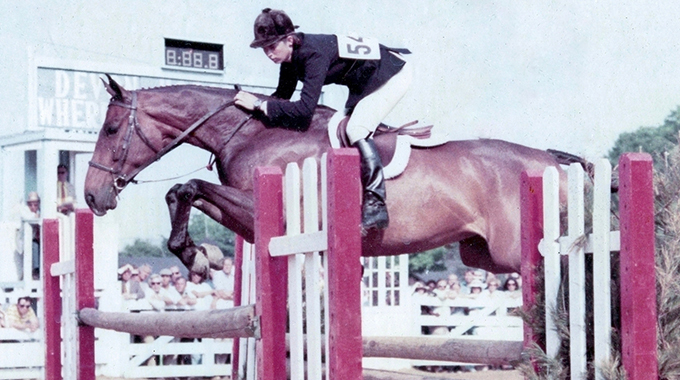 The United States’ first Individual Gold Medal winner in Show Jumping, Snowbound, came from modest beginnings. 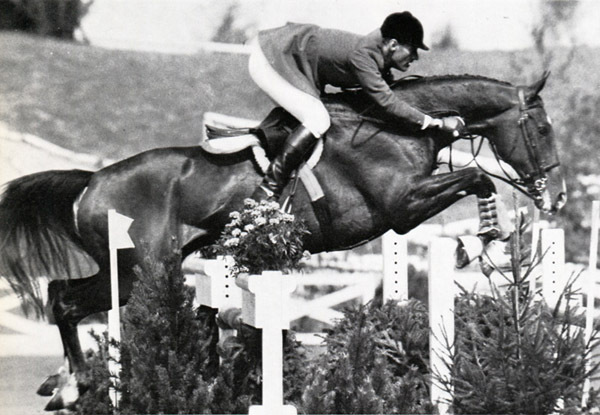 He knocked around the Northern California racetracks for three years before Barbara Worth (Oakford) found him and gave him the start of what would be a stunning show jumping career as a member of the United States Equestrian Team. Bred in California by William A. Steffan, the brown Thoroughbred gelding was foaled in 1958 and registered as Gay Vic. He was by Hail Victory (by *Blenheim II), out of Gay Alvena (by Gay World). He stood just shy of 16.1 hands. In the three years that Gay Vic was at the racetrack, he only raced five times because of his propensity for tendon trouble. He bowed twice. Gay Vic never placed in a race. When Barbara Worth (Oakford) got Gay Vic to her barn, the grooms overheard her say that he had as good a chance as being snowbound as being a show horse. It was then that Gay Vic’s new show name was born – Snowbound. Ms. Worth was showing Snowbound in the Green Working Hunter division when John Galvin spotted him. At the time, Mr. Galvin was one of the USET’s largest benefactors. He bought and then loaned horses to the Team for all three disciplines and also owned a thirty-three-thousand-acre ranch near Santa Barbara, California where the Three-Day team trained. Mr. Galvin’s daughter, Patricia (later Princess de la Tour d’Auvergne), was a double gold medal winner in Dressage at the 1959 Pan Am Games on her horse Rath Patrick and competed in two Olympic Games. 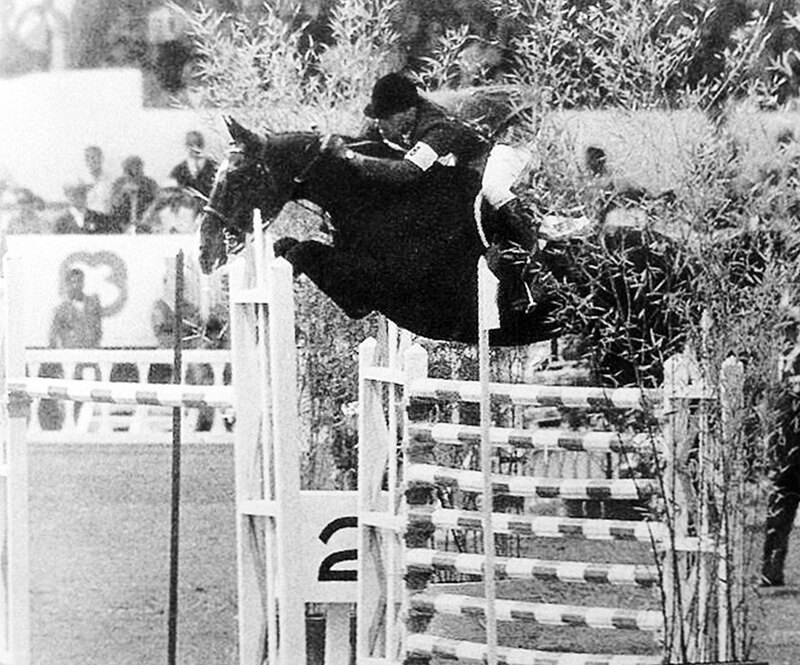 Some of the USET horses that the Galvin’s loaned to the team were Night Owl (George Morris), San Lucas (Frank Chapot), and Grasshopper (Michael Page). 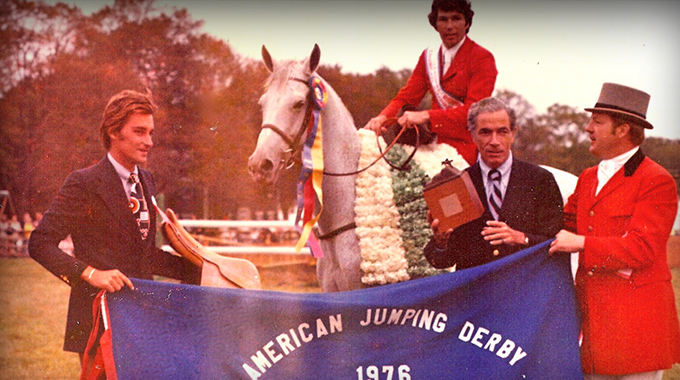 A good horseman that was known for his uncanny ability to pick Olympic caliber horses, Mr. Galvin bought Snowbound as a gift for his daughter and then called Bill Steinkraus to tell him about the new horse that he was sending to the USET for him to ride. When Snowbound arrived at USET headquarters in Gladstone, New Jersey in early 1964, both Show Jumping Team Coach Bert de Nemethy and Bill Steinkraus liked him very much. He had a nice short back, beautiful shoulder, long front-end, and was a natural mover – the perfect formula for a great jumper—but he had little foundation on him. Coach de Nemethy started all of the Team’s horses with flat-work at the beginning of each year so Snowbound became a part of that program. Since Mr. Steinkraus was a true amateur with a job in New York City, he was only able to go to Gladstone to ride three days each week—Wednesday, Saturday, and Sunday. During the time that he rode Snowbound, he concentrated on flat-work and cavaletti exercises. Snowbound was taught to lengthen or shorten his stride when asked. He became very adjustable. When the experienced Team horses shipped to Europe that Summer, Snowbound went along. Mr. Steinkraus rode him slowly in Speed classes at the largest venues in Europe for experience. None of the jumps fazed the little brown horse. That Summer, Snowbound jumped a lot of slow clear rounds throughout Europe. Although he was very brave over the jumps with the heart of a lion, Snowbound was not an easy ride. When spooked, he tried to run as far away as possible. He disliked loud noises, particularly bands and their drums. Mr. Steinkraus tried to avoid putting Snowbound in situations that would upset him. They suited each other perfectly. Another green horse who had a spectacular week was Snowbound, ridden by Bill Steinkraus. Snowbound’s performance made him stand out as prominently among the U.S. riders as the U.S. team did over its competition. I’m not going to take on San Lucas and maybe get Snowbound hurt. At the moment Snowbound doesn’t know there is anything he can’t do. I don’t want to get him in a bad wreck and shake his confidence. Right now he’s jumping like a kitten, flexible and relaxed. He hasn’t learned the precision of a cat. On the show’s final night, however, Snowbound behaved more like a tiger than either a cat or a kitten, and critics who have claimed that Bill Steinkraus is more of an intellectual rider than a do-or-die competitor had to revise their opinions. 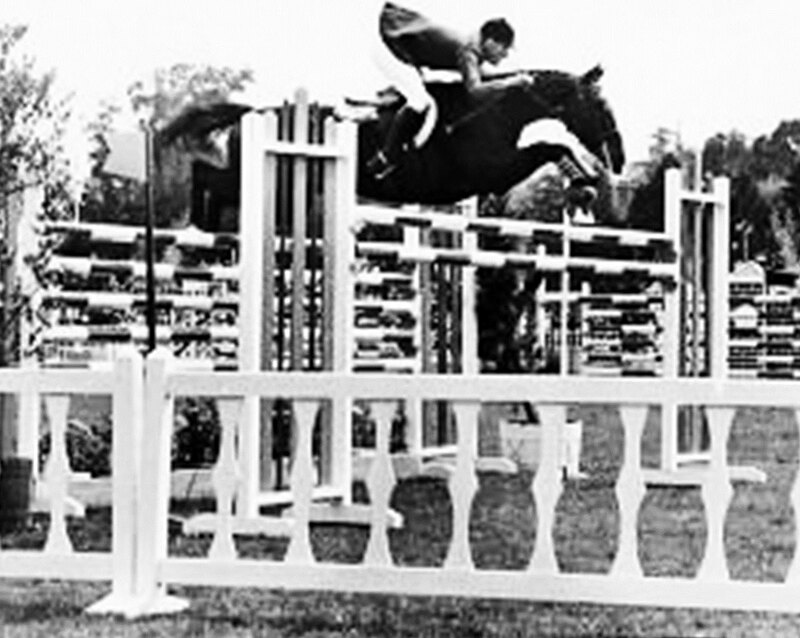 Only the four U.S. riders were involved in the jump-off, and the first two, Mary and Frank Chapot, had knockdowns. The course was extremely tight, with sharp turns and angled fences. Kathy Kusner, an all-out competitor who was tied with Steinkraus for individual honors, had a clean trip and a good time of 41.2 seconds. So it was up to Bill, against a clean round and the clock. From the second he passed through the timer it was apparent he was going all out. Snowbound skidded slightly but recovered and cleared the fence, then went into a sharp turn, his hind quarters slipping completely from under him. Billy went out of the saddle, lost his hat and almost lost his horse. But rider and horse recovered in a split second, angled into the next fence, and were clean the rest of the way. They finished nearly three seconds ahead of Kathy. The video of the aforementioned winning round by Bill Steinkraus on Snowbound in the 1965 Grand Prix Of New York. Mr. Steinkraus had to win this class to be Leading Rider over Kathy Kusner. The footage in this video was made possible by Gordon Wright, one of the founding fathers of modern riding and the forward seat, who documented on film these legendary riders and their incredible horses. The video was produced by EquestrianCoach.com. From time to time, Snowbound’s old racetrack tendons would develop some filling. No chances were taken, so when that happened, he was rested. When he did show, Snowbound was saved for the Nation’s Cup classes and the Grand Prix. Mr. Steinkraus and Snowbound were always the anchor ride in Nation’s Cups. In one stretch, they jumped fifteen out of sixteen clear rounds. At the National Horse Show in 1967, Snowbound did not have a single fault in all of his classes. As the USET prepared for the 1968 Olympics in Europe, Snowbound jumped critical double-clears and the team won all of the Nation’s Cups that they entered including Aachen, London, and Dublin. Mr. Steinkraus and Snowbound also won the prestigious Daily Mail Cup at London with the only clean round in the jump-off. Snowbound was fit and sound as October rolled around for the 1968 Olympic Games in Mexico City. The individual competition took place over two rounds. The first round was over a very big technical track of fourteen jumps with a tight time allowance. The jumps were built at the maximum height for that era (the maximum height has since been lowered). Of the eighty-four riders that competed, only four were within the time allowed and only two had clean rounds—Marion Coakes on Stroller (of Great Britain) and Bill Steinkraus on Snowbound. Snowbound with Bill Steinkraus over the first jump in the first round of the Individual competition at the 1968 Olympics in Mexico City. The top fifteen from the first round returned for a second round over a shortened course of just six jumps. Again, the course was huge. The wall was set at 5’9” and there was a monstrous oxer that Mr. Steinkraus measured at 5’9” x 6’ high x 7’3” wide. Stroller went next to last and had two rails down. Mr. Steinkraus knew that he could still have one rail down and win the Gold Medal. Snowbound with Bill Steinkraus over the wall in the second round of the Individual competition at the 1968 Olympics in Mexico City. Snowbound was foot perfect around the gigantic second-round course except for lightly laying a hind toe on the front rail on the tremendous oxer and causing it to come down. Although he had injured his tendon over the enormous oxer, he continued on to jump clear over the final two-stride in-and-out. Four faults. That was what they needed. For the first time in history, a member of the USET had won the Individual Gold Medal in Show Jumping at the Olympic Games. Snowbound with Bill Steinkraus over the huge oxer in the second round of the Individual competition at the 1968 Olympics in Mexico City. Pictures from the left side. Snowbound with Bill Steinkraus over the huge oxer in the second round of the Individual competition at the 1968 Olympics in Mexico City. Pictured from the right side. Here is a video of the 2nd round of the 1968 Olympics. Video footage credit: Gordon Wright. Produced by EquestrianCoach.com. Snowbound rested and healed for the entire year of 1969, but he then went on to win many more big classes in the next three years leading up to the 1972 Olympics in Munich. When he failed to qualify for the second round of the Individual competition at the Olympics, it was decided that Mr. Steinkraus would ride Main Spring in the Team competition. The US Team won the Silver Medal that year. 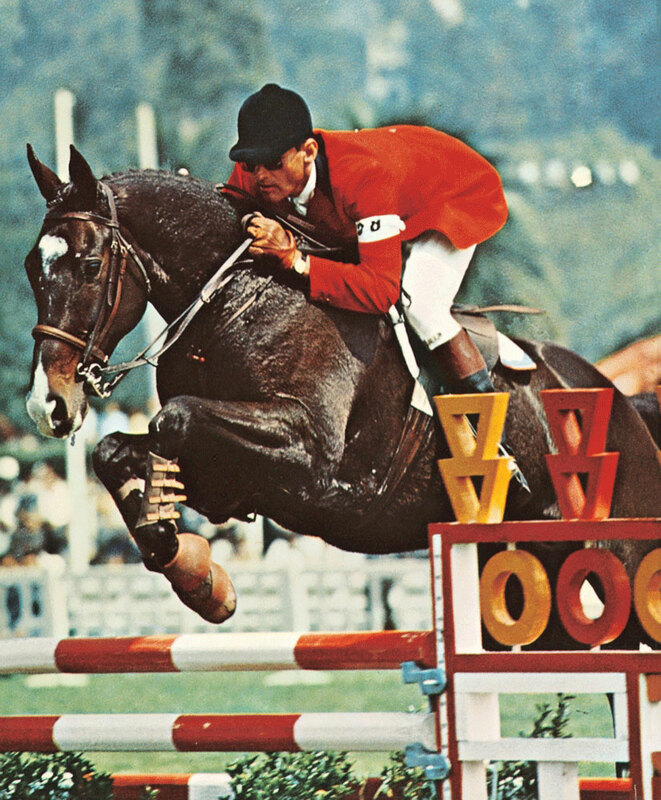 Snowbound was retired after the 1972 Olympic Games at the age of 14. He lived out his life at John Galvin’s farm near Dublin. 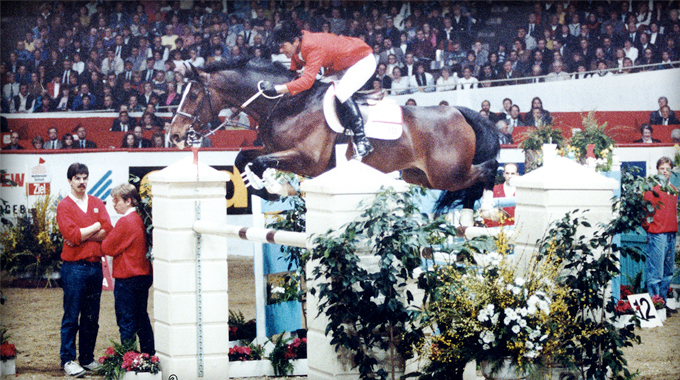 I am thrilled that Snowbound has been inducted into the Show Jumping Hall of Fame, for I think he truly belongs. Like all great horses, Snowbound was very much a one-off, a totally unique individual, with a very distinctive personality. He was not the fastest horse I ever rode, nor the strongest, nor could he jump the biggest puissance fence, and he certainly didn’t have the easiest temperament. However, the bigger the occasion, the more he rose to it, and he never gave up. I’ve wracked my brain for a long time trying to formulate a short description that did him justice, but the best I can come up with is this simple statement: If my very life depended on jumping a clear round over the biggest, trickiest, most technical jumper course I can imagine, the horse I would want to be riding would be Snowbound at his best.